Love the attention to detail in your car GF. I have a feeling we crossed paths many, many years ago on the dieselstation forums in the photography section. You were just getting into photography or something, and your shots were amazing already. I think. I'm not sure. It was so long ago. Dieselstation was an amazing forum, it’s where a lot of up and coming photographers met and learnt a lot. I’m still in contact with a lot of the guys from there, often pitching against them for the top commercial jobs which is pretty mad! I still pinch myself that I’m lucky enough to be able to make a living doing something I enjoy so much! The comments on here have convinced me to go with Cup 2s. Just one quick question is it 215/45/17 on front? Had another bit of track time yesterday at Silverstone on a private trackday run by Topaz Detailing for their customers. The level of cars present was quite frankly ridiculous, and the majority of drivers were very good. It was run on the international circuit, which I'd not driven before and as I could only stay until 12, I didn't fully get to grips with it, especially as it's quite bumpy. I managed a 1:17.1 according to my vbox, will look at what the ideal time is and where I'm losing the time. I like doing a bit shorter a track than the GP, to be honest, as it gives you a chance to change the damper settings, do a short session and feel the difference. I stiffened the high-speed compression a lot and the car felt a lot more stable, although the car has some mid-corner bounce when fully loaded, which I believe needs to be sorted either with the ARBs, or with stiffer springs? Unfortunately, my Go-Pro decided it didn't want to work yesterday, so I only have a couple of fly by clips, which show the kind of cars battling on track. Overtaking on both sides is quite nice, and good respect was shown between drivers as most knew each other. To be honest, the Exige has no right to be even close to a lot of these cars, so I was very happy to be battling with them. Special shout out goes to the Carrera GT, which was just a total joy to watch! Hi @GFWilliams, am I right in thinking that you have been (and are still) running Komotec headers, downpipe and linkpipe with sports cat, but mated to a 2bular backbox? i am looking to go with that combo myself and curious if there is anything I should watch out for? Will the 2bular backbox fit ok to the KT linkpipe? I remember reading you had some problems with your initial installation. Is the KT system the same pipe diameter as the 2bular system? So I have the Komo-twc manifolds and downpipe. Very happy with the performance, although judging by @Mark030358‘s recent dyno, the 2bular manifolds offer slightly better torque and maybe power (hard to tell as he has a 380). I have two different systems from after the downpipe, both from 2bular. The first system is the sports cat and the valved trackday exhaust. This system is designed to be quiet, and with the “add on” silencer tips, it recorded 90db static which is very impressive. The second system is a decat pipe and a lightweight backbox. This is very loud and spits some flames, although I think my old road exhaust sounded better if I’m honest. I have the 2bular valved road exhaust and am contemplating getting the EPK manifolds - how loud is it with your manifolds and your road exhaust? The std exhaust is perfect really but can't help wanting a bit more popping and banging and the performance gains - but worry it might be a bit much. When you have it in touring I assume it's manageable? Thanks in advance! Re exhausts... I spoke at length with 2bular re which exhaust to use before I did my 460 upgrade and Jim was very honest. He said the KT manifold "may" make more power than his due to the design (stepped or something, can't quite remember exactly) but that his down pipes would for sure produce more torque (which they surely do) due to the bore size. I was going to fit a 2bular back box too, and as proven by GFW this make a few more hp. Also as GWF stated, and to be honest I did not notice this myself from my dyno curve, the 380 makes max power at 7000 rpm, not 7200 rpm, so maybe there is more hp if you have the engine that can go to 7200 rpm. Also of note is that looking at the earlier cars, they appear to have a steeper ramp rate up to 3500 rpm than my 380. For sure this is a function of the 380 ECU. Just buy 2bular, you won't be disappointed. However all that said, a fantastic upgrade as GFW will testify. Thanks @Mark030358, that is really helpful. My car is a 350 Sport. I do very much like the idea of running full 2bular system and no doubt it is great. However, I already have the EX370 kit fitted (ie carbon air intake plus remap) and I’d like to get to add the EX390 kit to that as well so that I get the manifolds and sports cat plus a further remap. If I went 2bular, it would be harder to get a remap done to make full use of the hardwear. The EX390 kit doesn’t include the downpipe slightly annoyingly. KT do sell a downpipe separately which I would add to the kit. That does seem to have a larger bore than standard at least. Does anyone know exactly what diameter the KT downpipe is and how that compares to 2bular? Would finish it off with track valveless backbox with 100mm Ti tips that I am currently trying to get Jim to ship me! I think that set up should give me a nice round 400bhp with good responses and would be a sweat spot for me. I can then decide if I want to go chasing the real big power sometime in the future, but that won’t be for a while. Thanks again - all advice/thoughts welcome! Power is a product of torque by engine speed - to have higher power at given engine speed you must have higher torque at that engine speed. What is described above means different profile of torque, which I doubt to be that immediately driven by small differences in the exhaust without changing the ECU mapping (torque is affected massively by ignition advance and boost, which are both defined not by the exhaust unless the ECU have to pull the ignition due to knocks). All in all I'd treat these statements of "that's why it makes few more hp at different engine speed in different car at different point in time" as a pseudoscience. Fair play. I can only repeat what I see of the dyno curves taken from the same machine, for same upgrade, but with different kit attached. Not trying to be a scientist, just honest, nothing more, nothing less. And I can't recall where I said..."that's why it makes few more hp at different engine speed in different car at different point in time". I actually said said "maybe there is more hp if you have the engine that can go to 7200 rpm"
However, before this gets into another "2bular are shite" posts no more comments from me on this subject. I really did not say that anything is not good, only wanted to make sure we don't get into possible confusion over few hp difference observed between different cars and perhaps share some helpful facts on how the power and torque are related. Generally I think there is a bit of overly strong emphasis on hardware changes here and indifference towards mapping impact - while the latter is frequently absolutely critical to a safe and consistent power. Enjoy your cars gentlemen, whichever way you've made them to be. The cars are the same apart 380 vs 350 original engine and KT manifolds vs 2bular manifolds. The mapping is done for each car and dyno testing makes sure it's optimised for each car for the hardware it's using, so not really sure what your point is regarding mapping. Mark has more torque, which means if his car had an extra 200rpm (to match my 7200rpm), it would produce more peak power. @Mattmahope It's pretty pointless doing the exhaust system IMO unless you map to it to get the gains. Personally, I'd just do a 410 or 430 kit from KT and know the map matches the hardware. Thanks @GFWilliams, @Mark030358 And @vd9, really appreciate the constructive feedback/advice, all given and taken in good spirit I have no doubt. Certainly do not want any bashing of anyone - in fact the only “problem” seems to me that we are so spoilt with amazing options for our cars! I follow what all you guys have done pretty closely and am inspired. Ultimately, I do agree with the sentiments re importance of mapping, which is why I want to go down the EX390 kit route. That means I get the KT hardwear plus the remap (which, when combined with my existing EX370 kit, will be an unofficial “EX400”, being effectively the EX430 kit without the modified pulley). Should work well to give me the kind of performance I want for the time being along with providing a decent base for whatever I end up doing in the future (KT460 or TVS1900 of some flavour, or nothing further at all). I don’t want to go for either the EX410 or EX430 at this stage because I don’t want to start making changes to the supercharger unless it is for one of the really big power kits, plus I want to put the difference in price towards getting my Ohlins TTX installed and set up with new Cup 2s all round. However I do really love the 2bular backbox because of the sound, the look, and the abilty to manage the silencing to get on track. That really was the reason behind my original post, to see if there were any issues combining the two systems in that way. It sounds like there actually is (which is a little annoying) but that these are easily surmountable. Fair summary? In the original setup, the cats are built into the manifolds, before the downpipe. The backbox then has a pipe which joins up to the downpipe. When you change the manifolds, the sports cat is then put after the downpipe, where the link pipe used to be before the backbox. The connection between the sports cat and backbox is a slip on connection I believe when done by KT. Jim uses high-quality VBand connectors, which are actually a much better solution, less prone to leaks etc. To make a 2bular backbox fit to the KT sports cat, KT cut my old link pipe to make the VBand work. Since then, Jim has re done the sports cat section to make sure it fits as perfectly as possible on my car. Hopefully, that clarifies a bit. There is a solution, and now I have a sports cat or a decat pipe I can use which fit with the VBands perfectly. In terms of noise, the road exhaust becomes a little louder with KT manifolds etc, and a slightly higher pitched tone. My car doesn't really pop/bang much, which I guess is due to the mapping being good. The only time I do get a "bang" from the exhaust, is with the decat pipe and when lifting off the throttle at high revs after accelerating hard. How many dyno runs was your car taken through to "optimise for each car"? Ultimately, dynos are nowhere near +/-2-3% precision you're looking at at your graphs, especially when not done back to back. It is also not a massive problem as for sure both cars make very decent power outputs, which is probably what both of you wanted. Could these same cars make more power if mapped differently - probably yes, but you'd probably also not want it due to potential damage to the drivetrain. One degree of ignition advance at 6,000-7,000 rpm most likely means more than difference between the pieces of metal you were discussing above, yet there is on average no appetite to consider these matters here. Hopefully to make it clear - I have no interest in having any confrontation here and was initially only addressing the part of considerations regarding "this piece of kit may make more power and that piece of kit may make more torque"
I’ll be buying Cup 2 again, I think it’s the best tyre available for the Exige (I feel like I’ve tried most now!). I’ll be going for 225 front (to see if it fits!) and 285 rear (I never had problems with understeer on them before). After having abused my first set of Cup 2 tyres I tried the Trofeo R and got very positively impressed. However, due to an issue with rear left tyre (loses a bit of air under track use!) I am going to change again. Did you tried the A052, and how do they compare with Cup2 and Trofeo for track use mainly. I think the Trofeo would have more grip if they were the same sizes, but 10mm wider on the front and 20mm wider on the rears with Cup 2 makes them quite equal in terms of grip I think. The Cup 2 last a LOT longer too! I haven't tried A052, for me, the Cup 2 are the perfect road and track solution for summer (with Sotto Zero for winter). 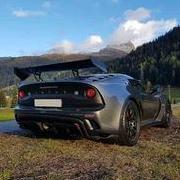 Small update on my Exige as this is supposed to be a project thread. The car is currently at Back on Track as the Nitron 3 ways have been sent back due to an unfortunate seized adjuster. I've taken the opportunity to get them to check all 4 dampers despite only having the problem with one. The cost wasn't that different so I thought it was worth doing for peace of mind. On the 430 Cup, the spring rates are 550lbs/1100lbs. I believe that once you lower the car down a bit and add some front camber to aid turn in, this means that the spring rate isn't ideal for handling (turn in is much better, but the balance is a bit out). After a (long!) chat with @Seriouslylotus, we both agreed that it would be beneficial to either get softer rear springs or harder front springs. Softer rears would mean better road comfort, but as well as the balance of the car, I also wanted to try to reduce the dive of the car under braking. 550 to 750lbs is quite a big jump in spring rate, but I used to run a stiffer spring rate on my old Nitron 1 ways and I found that the car felt sharper and more alert on them which I hope will be the case with these new front springs. I also had an annoying knocking sound which was caused by some missing bolts on the front undertray which has been sorted at the same time. BoT also discovered excessive play in the track rod ends which explains the car not feeling quite as tight on my last day at Silverstone. Sounds good to me . For once my company isn't making the most expensive product !